3. Diploma in Dairy Process.. There are 6 Animal Husbandry Polytechnics and one Fisheries Polytechnic in Sri Venkateswara Veterinary University. Two year Diploma in Animal Husbandry is offered at the Animal Husbandry Polytechnics and two year Diploma in Fisheries is offered at the Fisheries Polytechnic. a) The students who have studied a minimum of 4 years from Non Municipal Areas (Rural) out of their 10 years of study (1st class – 10th Class) are eligible for admission, for which the student is advised to fill up the Form-3, get it signed by the respective principal / Head Master of the school where he/ she has studied. In case if the student has studied in one or more schools he/she has to enclose Form-3 from each school. If the Form-3 is not enclosed the application will be rejected. (b) The student who have completed 10th class or equivalent exams are only eligible to apply for the Diploma courses. The students who have completed intermediate or any other higher studies are not eligible to apply. (c) The students belonging to B.C and General Category who are applying for the Diploma courses should have a minimum of 6.0 grade point average (including Hindi). (d) The students belonging to SC/ST & P.H category should have a minimum of 5.0 grade point average ( including Hindi). (e) The students belonging to BC & General category who have completed the 10th class before 2013 schould have a minimum of 58% of marks and SC/ST & P.H students need to have a minimum of 49% of marks. (f) The students who are studying intermediate 1st year and II year are requested to bring a Custodian Certificate from the respective college Principal stating that all the Original Certificates of the student are present under his control. i) a) 29% seats are allocated to Backward class (B.C). b) 15% seats are allocated to S.C candidates. c) 6% seats are allocated to S.T. candidates. ii) 33.1/3 % seats are allocated to Girls /Women. iii) 3% seats are allocated to Physically challenged/Differently abled candidates. iv) 2% seats are allocated to children of Ex-Servicemen, Defense, Border security Force, Central Reserve Police, etc., who have resided 5 years in Andhra Pradesh. vi) 0.5 % seats are allocated to candidates with good/ excellent performance in Sports at International, National and state. 15% seats shall be Un-reserved (U.R) and are allotted to candidates from both Andhra University and Sri Venkateswara University on merit basis irrespective of region. The 85% seats shall be allocated in the ratio of 42:22 between Andhra University, and Sri Venkateswara University respectively for the candidates in relation to local area. sufficient for applying for all the three diploma courses (Animal Husbandry, Fishery and Dairy processing). The Diploma course is for 2 years. Each year consists of 2 semesters in total there will be 4 Semesters in 2 years. There will be 3 semesters course work and one semester work Experience programme. MEDIUM OF INSTRUCTION: The course will be dealt in Telugu language only. There is hostel facility separately for both boys and Girls in all the polytechnics. If a student wants to stay outside, he has to take the Principal permission. Candidates applying for the diploma course are requested to enclose the following documents. i] Xerox copy of the S.S.C/ 10th class Hall Ticket. ii] 10th class marks transcript. ix] Certificates certifying the physically challenged (or) Differently abled candidates. • All the applications are to be uploaded online with in the due date. • All the candidates are advised not to involve in the raging process. • The University has rights to change or cancel the admission process. 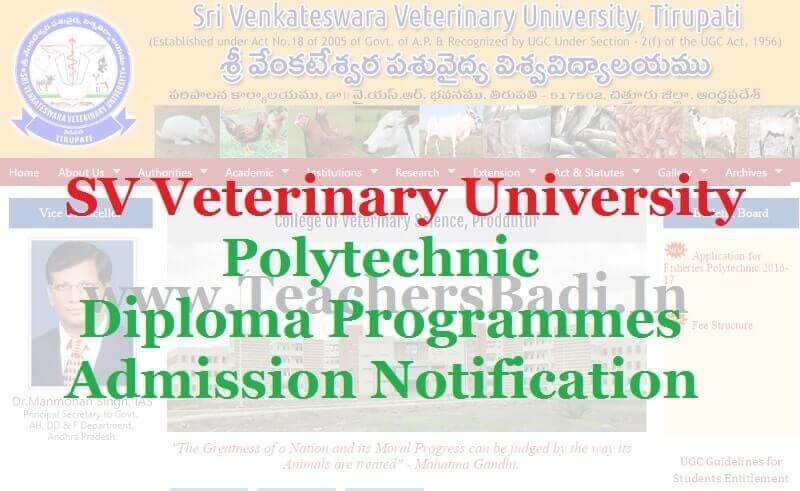 • Sri Venkateswara Veterinary University will award the diploma certificates to the candidates who complete the 2 years diploma courses and University will not have any responsibility to provide any job. • The candidates completing the 2 years diploma courses are not eligible for B.V.Sc.,& A.H , B.F.Sc., & B.Tech (Dairy Technology) course admissions. i) (a) The students are selected for the Diploma courses based on the overall grade point of the students in 10th standard or any other equivalent examination. For the candidates who have completed 10th standard before 2013 the 10th marks are converted in to grade for the sake of preparing merit list. (b) If any case 2 or more students attain same overall grade point average marks in Science subject are taken into consideration while preparing the merit list. (c) If any case 2 or more students attain same overall grade point average same equal marks in Science subject, then the marks in Mathematics are taken into consideration while preparing the merit list. (d) If any case 2 or more attain same overall grade point average same marks in Science & Mathematics, then the marks in Social studies are taken into consideration while preparing the merit list. (e) If any case 2 or more students attain same overall grade point average and same marks in Science, Mathematics, Social studies then the marks in Telugu are taken into consideration while preparing the merit list. (f) In any case 2 or more students attain same overall grade point average and same marks in Science, Mathematics, Social studies, Telugu, then marks in English are taken into consideration while preparing the merit list. (g) If any case 2 or more students attain same overall grade point average and same marks in Science, Mathematics, Social studies, Telugu, English then the marks in Hindi are taken into consideration while preparing the merit list. (h) If any case 2 or more students attain same overall grade point average and same marks in science, Mathematics Social studies, Telugu, English & Hindi, then the candidate with higher date of birth (Higher age) will be considered while making the merit list. Filled in Applications should be sent to Registrar, Sri Venkateswara Veterinary University, Administrative Office, Dr.Y.S.R.Bhavan, Tirupati. My GPA was 8.2i got seat vertinary diploma.